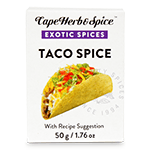 Our blend of authentic Mexican herbs and spices, redolent of chilli, cumin and smoked paprika. Add to slowly braised minced beef to make a spicy filling for Taco shells. Rub onto chicken strips, then grill or panfry for chicken fajitas.